The Vickers VC.1 Viking was a British twin-engine short-range airliner derived from the Vickers Wellington bomber and built by Vickers Armstrongs Limited at Brooklands near Weybridge in Surrey. In the aftermath of the Second World War, the Viking was an important airliner with British airlines pending the development of turboprop aircraft like the Viscount. An experimental airframe was fitted with Rolls-Royce Nene turbojets and first flown in 1948 as the world's first pure jet transport aircraft. 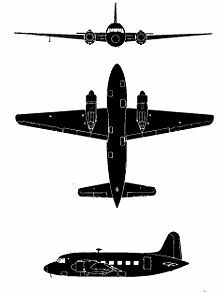 The Ministry of Aircraft Production ordered three prototype Wellington Transport Aircraft to Air Ministry Specification 17/44 from Vickers-Armstrong Limited. The specification was for a peacetime requirement for a medium-short haul passenger aircraft. To speed development the aircraft used the wing and undercarriage design from the Wellington but the fuselage was new. Although the original contract referred to Wellington Transport Aircraft, on completion, the name Viking was chosen. The prototype (designated the Type 491 and registered G-AGOK) first flew at Wisley Aerodrome on 22 June 1945. This aircraft crashed on 23 April 1946 due to a double engine failure; no fatalities occurred as a result of the crash. Following successful trials of the three prototypes the British Overseas Airways Corporation (BOAC) ordered 19 aircraft. The first BOAC aircraft flew on 23 March 1946. The prototypes were then used for trials with the Royal Air Force which lead to orders for military versions (the Viking C2 (12 ordered as freighter/transports) and modified Valetta C1). The initial 19 production aircraft (later designated the Viking 1A) carried 21 passengers, they had metal fuselages and fabric-clad geodetic wings and tail units. Following feedback from customers, the next 14 examples, known as the Viking 1, featured stressed-metal wings and tail units. The next variant, the Viking 1B, was 28 in (71 cm) longer, carrying 24 passengers with up-rated Bristol Hercules piston engines, achieved a production run of 115. One of this batch was changed during production to be fitted with two Rolls-Royce Nene turbojet engines and upon its first flight on 6 April 1948 became the world's first entirely jet-powered airliner (albeit only a prototype). The Type 618 Nene-Viking flew Heathrow-Paris on the anniversary of Bl�riot's crossing of the Channel, 1948 taking only 34 minutes (c.210 mi/340 km, 370.6 mph/596.4 km/h). Some six years later, it was converted to a piston engined Viking. Production finished in 1948, including 16 for the RAF and the King's Flight, but in 1952 BEA adapted some to a 38-passenger layout, taking the maximum payload up from 5,500-7,200 lb (2,500-3,300 kg). All Vikings featured a tailwheel undercarriage. The 158th Viking became the prototype of the military Valetta, of which 261 were sold. When production of this strengthened but externally-similar type ended in 1951, a flying classroom version with tricycle undercarriage was already being delivered to the Royal Air Force (RAF), called the Varsity. All but one of those entered RAF service, the other example going to the Swedish Air Force. The production of 161 Varsitys kept the Hurn works busy until January 1954, and they enjoyed a long service life. Examples are preserved at Brooklands Museum, the Imperial War Museum Duxford and the Newark Air Museum. The first Viking was flown from Vickers' flight test airfield at Wisley, Surrey, by chief test pilot Joseph "Mutt" Summers on 22 June 1945 and the third aircraft built was delivered to BOAC at Hurn near Bournemouth on 20 April 1946. Upon the delivery of nine examples to BOAC for development flying, including the two remaining prototypes, British European Airways (BEA) was established on 1 August 1946 to operate airliners within Europe and these first VC.1 Vikings were transferred to the new airline. After a trial flight from Northolt to Oslo on 20 August 1946 by the newly formed BEA, the first regular Viking scheduled service commenced between Northolt and Copenhagen on 1 September 1946. In all 163 Vikings were built. 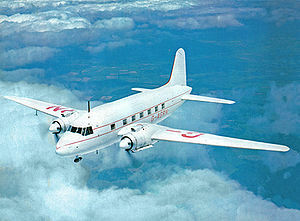 The initials "VC" stood for Vickers Civil, echoing the "DC" precedent set by the Douglas Aircraft Company of the USA, builders of the DC-1, DC-2 and DC-3 Douglas Dakota, the latter also bought by BEA and of a similar configuration to the Viking. Vickers soon ceased to use the 'VC' letters, instead using type numbers in the 49x and 600 series, which indicated the specific customer airline. BEA operated their large fleet of Vikings on many European and UK trunk routes for eight years. From 1951, the remaining fleet was modified with 36, instead of 27 seats, and named the "Admiral Class". 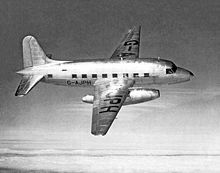 BEA operated the Viking until late 1954, when the last was displaced by the more modern and pressurised Airspeed Ambassador and Vickers Viscount. BEA sold their Vikings to several UK independent airlines for use on their growing scheduled and charter route networks. Some were sold to other European operators. An ex-BEA Viking 1B was fitted out as a VIP aircraft for the Arab Legion Air Force, mainly for the use of the King of Jordan. Most Vikings had been retired from service by the mid 1960s and the sole surviving example in the UK is owned by Brooklands Museum where it is under long term restoration. Prototypes with two 1,675 hp (1,250 kW) Bristol Hercules 130 engines, three built. Initial production version with geodetic wings and two 1,690 hp (1,261 kW) Bristol Hercules 630 engines. Production aircraft with stressed skin mainplanes and two 1,690 hp (1,261 kW) Bristol Hercules 634 engines. Viking 1 with "long nose", 113 built. One Viking 1B aircraft modified for trials with two 5,000 lbf (22.3 kN) Rolls-Royce Nene I turbojets. British military designation of the Viking 1; VIP transport aircraft for the King's Flight of the RAF. Modified design with strengthened floor and large freight door. Modified Valletta design with tricycle undercarriage for navigation and crew training. Viking 1B for Indian National Airways with two Hecules 634 engines. Valetta prototype for Ministry of Supply with two Hercules 634 engines. Projected fuel transport variant, not built. Viking 1 for the Argentine government with two Hercules 634 engines. Viking 1 for the Argentine government with two Hercules 630 engines. Viking C2 for the Royal Air Force with two Hercules 130 engines. Viking C2 for the Royal Air Force with two Hercules 134 engines. Two ordered for use by the King's Flight for a royal tour of South Africa, one aircraft for the King and one for the Queen. Viking C2 for the Royal Air Force with two Hercules 134 engines. One ordered for use by the King's Flight for a royal tour of South Africa for use by the state officials in 21-seat configuration. Viking C2 for the Royal Air Force with two Hercules 134 engines. One ordered for use by the King's Flight for a royal tour of South Africa as a mobile workshop support aircraft. Viking 1B for DDL with two Hercules 634 engines. Projected 34-seat variant, not built. Viking 1B for Air India with two Hercules 634 engines. Viking 1B for Aer Lingus with two Hercules 634 engines. Viking 1B for South African Airways with two Hercules 634 engines. Valletta C1 for the Royal Air Force with two Hercules 230 engines. Viking 1 for Suidair International with two Hercules 630 engines. Viking 1B for Pakistan Air Force with two Hercules 634 engines. Valetta C1 for the Royal Air Force with two Hercules 634 engines. Vicking 1A conversions from Type 498 for BSAAC. Royal Australian Air Force - One Viking C2 in service from 1947 to 1951. 5 April 1948 - G-AIVP operated by British European Airways collided with a Soviet Yak-3 near Berlin, 15 killed. 21 April 1948 British European Airways Flight S200P crashed on approach to Glasgow-Renfrew Airport. No one was killed but 14 were injured. 8 February 1949 - OY-DLU operated by Det Danske Luftfartselskab (DDL) crashed into the sea off Oresund, Denmark, with the loss of all 27 occupants. 31 October 1950 - G-AHPN operated by British European Airways crashed on landing in bad visibility at London Heathrow Airport, England; 25 passengers and three crew died. 17 February 1952 - G-AHPI operated by Hunting Air Travel flew into the La Cinta mountain range, Italy, with the loss of all 31 occupants. 5 January 1953 - G-AJDL operated by British European Airways crashed on approach at Belfast-Nutts Corner Airport, Northern Ireland, three crew and 24 passengers died. 1 May 1957 - G-AJBO operated by Eagle Aviation crashed after engine failure near Blackbushe Airport, England, five crew and 29 passengers died. 2 September 1958 The 1958 London Vickers Viking accident happened when G-AIJE crashed into a house as the flight crew were trying to land back at London Heathrow Airport. All three crew died and four on the ground also died. 9 August 1961 - G-AHPM operated by Cunard Eagle Airways crashed into a mountainside near Holta on approach to Stavanger Airport, Sola in Norway with the loss of all 39 occupants. 11 September 1963 - F-BJER operated by Airnautic crashed into a mountain in the Pyrenees with the loss of all 40 occupants, the worst Viking accident. Viking 1 G-AHPB - Was displayed in Technorama Museum at Winterthur, Switzerland. Scraped . Viking 1 ZS-DKH - Partly restored , preserved in South Africa at OR Tambo International Airport. Viking 1B J-750 - On display at the Pakistan Air Force Museum Karachi, Pakistan. Taylor, H.A. "The Viking... Vickers Commercial One". Air Enthusiast, No. 21, April-July 1983, pp. 38-48. ISSN 0143-5450.